Panel discussion May 24, 2016 at the FINRA annual conference. John Kalohn, Joe McDonald and Roni Meikle from FINRA discussed coming restructure of qualification exams. Another goal appears to be a desire by FINRA and member firms to expand the number of people who can and will get licensed to work in the securities industry. Exam restructure launch date has been postponed, at least a year, till January 2018 at the earliest. Exams slated to be retired, will not be retired till 2018 restructure launch date. These include the Series 11 (Order Processing Assistant), Series 42 (Options Representative), Series 62 (Corporate Securities Representative) and Series 72 (Government Securities Representative) exams. The panel noted that only one person had taken the Series 72 in the past year. Anyone holding registrations that are being retired (Series 11, Series 62, Series 72) will be able to continue to hold them until they leave industry for more than 2 years. Series 17/37/38 Exams – FINRA will retire these exams and use the UK and Canadian certifications to exempt certificate holders from the Essentials Exam. Exams that will remain as “Top-off” exams: Series 6, 7, 22, 57, 79, 82, 86/87 and 99. Top-off exams will be shorter than current exams. Essentials exam currently envisioned to be 100 questions long. Unlike the current system, you will not need to be associated with a member firm to take the Essentials Exam. In other words, you won’t need to have a job with a broker-dealer to take the Essentials Exam. If you pass the Essentials Exam, it will be valid for 4 years from your passing date. Just passing the Essentials Exam will not be enough to qualify you to be a registered person with FINRA. To become a registered person, you will have to have a job with a FINRA member firm, file a U4, get finger-printed, and pass a Top-off exam. What if you are currently registered? Current registrants will maintain registration(s) without the need for additional testing. Most current registrants will be considered to have passed the Essentials Exam, and it will be valid for 4 years upon leaving the securities industry. Registrants who return to the securities industry within 2 years will regain registration without needing to take the Essentials or Top-off exam. Registrants who return to the securities industry between 2 and 4 years later will not need to take the Essentials Exam, only the Top-off exam for the registration position. Registrants who return to the securities industry more than 4 years later will need to take both the Essentials and the top-off exam. Securities Essentials Exam is being finalized by FINRA and committee of industry representatives. • Give firms an opportunity to employ new business models for onboarding staff. • Allow firms to better gauge industry knowledge of interns and other potential employees. • Allow non-registered staff (e.g., administrative) to take Essentials Exam. • Through CRD, firms will be able to confirm whether and when an individual passed the Essentials Exam. 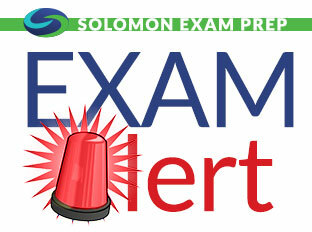 • Top-off exams will retain traditional names: i.e., Series 7 exam will remain the Series 7 exam. • Position designations in CRD will remain the same (i.e., GS will remain GS [Series 7]). • Firms will be able to schedule the Essentials Exam for support personnel through CRD. • Current registrants will not need to take the Essentials Exam to maintain current registrations. • Principal exams and registrations will not be directly affected. Under the new representative-level program structure, several principal exams cover subject matter already covered on the Essentials and the Top-off exams. This month’s study question from the Solomon Online Exam Simulator question database is now available! Question (Relevant to the Series 6, Series 7, Series 24, Series 26, Series 62, and Series 82): Which of the following would most likely be classified as a branch office? Rationale: A branch office is any location where one or more associated employees is in the business of soliciting or effecting (but not executing) the purchase or sale of any security. A location outside of a primary residence, for example, a vacation home, is considered a non-branch location as long as it is used for securities business fewer than 30 business days per year. The floor of a registered exchange is also considered a non-branch office if it is where a member firm conducts business with public customers. Congratulations to Alexa M. this month’s Study Question of the Month winner! This month’s study question from the Solomon Online Exam Simulator question database is now available. Rationale: The formula for calculating current yield is the annual interest on the bond ($60) divided by the current price of the bond ($1050) which is equal to 5.7%. Because ABC can finance the debt at a lower interest rate than they are currently paying there is a good chance that they will call the bonds. Congratulations Stephen Z., this month’s Study Question of the Month winner! All study questions are from Solomon’s industry-leading Online Exam Simulator. FINRA Rule 2040 became effective August 24, 2015. It replaces NASD Rules 2420 and 1060(b). This change affects the Series 6, 7, 24, 26, 27, 28, 62, and 82 exams. Rule 2040 further states that retired representatives may continue to be paid commissions on customer accounts if the representative and member have agreed upon the continuing payments before retirement. Rationale: All of these documents are necessary except for a copy of the will. The letters of testamentary suffice in this capacity. Congratulations Sakisha J., this month’s Study Question of the Month winner! On May 22, 2015, FINRA issued guidance concerning communications with the public. Here are some notable points from the guidance. A Series 26 registration does not permit a principal to approve retail communications concerning a business development company. The principal must have a Series 24, Series 9/10, or Series 39 registration instead. This alert applies to the Series 6, Series 7, Series 9/10, Series 24, Series 26, Series 39, Series 62, Series 82, and Series 99. This alert applies to the Series 6, Series 7, Series 52, Series 65, and Series 66. Effective June 26, 2015, FINRA will alter its rules regarding who will be considered a public or non-public arbitrator. The change will make it so that any arbitrator who has worked in the financial industry for any period of time will be considered a non-public arbitrator. Also, arbitrators who represent investors or the financial industry as a significant part of their business will be considered non-public arbitrators, but may become public arbitrators after a cooling-off period. The cooling-off period lasts five years if they were disqualified from being a public arbitrator based on their own actions. The cooling-off period lasts two years if they were disqualified from being a public arbitrator based on someone else’s actions. This alert applies to the Series 6, Series 7, Series 24, Series 26, Series 27, Series 28, Series 62, Series 79, and Series 82. On May 28, 2015 at the FINRA annual conference in Washington, DC, a panel of FINRA and industry representatives discussed proposed changes to restructure FINRA’s representative-level qualification program and fielded questions from attendees present at the meeting. According to Joe McDonald, Senior Director, Testing and Continuing Education Department, FINRA plans to reduce the number of representative-level examinations, currently numbering 16, in order to simplify the examination program and reduce the amount of redundancy across exams. FINRA proposes to do this by restructuring the current exam program into a format whereby all potential representative-level registrants would take a core general-knowledge exam and then additional specialized knowledge exam(s). The general knowledge exam is being called the Securities Industry Essentials Examination (SIE) or “essentials exam,” and the specialized exams are being called “top-off” exams. According to McDonald, the proposed changes will restructure the exam program without rewriting registration rules. The SIE, or essentials exam, content would include knowledge fundamental to working in the securities industry, such as basic product knowledge, structure and functioning of the securities markets, regulatory agencies and their functions, basic economics, professional conduct, and regulated and prohibited practices. A significant change in this restructure proposal is that individuals taking the SIE would not need to be associated with or sponsored by a FINRA member firm. Also, since the content of the essentials exam would be stable and less likely to change than the content on the top-off exams, a passing result on the SIE would be valid for 4 years, instead of the current 2 years for FINRA exams. This should make employment in the securities industry more accessible, flexible, and appealing. Passing the SIE alone would not qualify an individual for registration with FINRA. To be eligible for registration, an individual who has passed the SIE would also need to pass the appropriate top-off exam pertaining to one’s job function. If, following an individual’s registration with a firm, the job functions for which the individual is registered change and one needs to become registered in an additional or alternative representative-level position, one would not need to pass the SIE again. Rather, the registered individual would need to pass only the appropriate top-off exam. 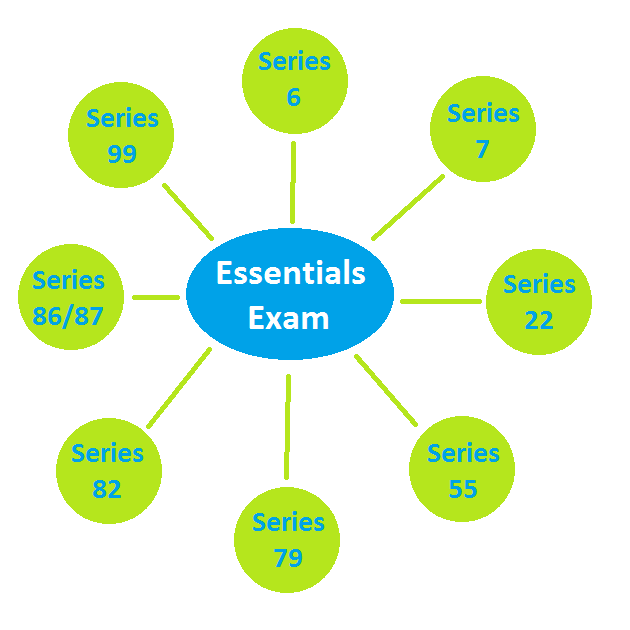 The essentials exam is expected to be 75-100 questions in length and the specialized top-off exams are expected to be shorter than the current representative exams. For example, the Series 7 is expected to be 150 questions in length, rather than the current 250 questions. As part of the restructuring, FINRA is proposing to retire the current registration categories of Options Representative, Corporate Securities Representative and Government Securities Representative as well as the associated exams, the Series 42, Series 62 and Series 72, respectively. FINRA is considering retiring the U.K. Securities Representative registration (Series 17) and the Canadian Securities Representative registrations (Series 37 & 38). Additionally, due to technological changes, FINRA is considering retiring the Order Processing Assistant registration (Series 11). Under the proposal, representative-level registrants who are registered, or had been registered within the past 2 years, prior to the effective date of the proposal would be eligible to maintain those registrations without being subject to any additional requirements. This means that most currently-registered individuals would be considered to have taken the SIE and it would be valid for 4 years after they leave the securities industry. Further, such individuals, with the exception of an Order Processing Assistant Representative, would be considered to have passed the SIE in FINRA’s CRD system; thus, if they wish to register in any additional representative category after the effective date of the proposal, they could do so by taking only the appropriate top-off exam. However, with respect to an individual who is not registered on the effective date of the proposal but was registered within the past two years prior to the effective date of the proposal, FINRA will administratively terminate the individual’s SIE status in the CRD system if such individual does not register with FINRA within 4 years from the date of the individual’s last registration. FINRA says it will begin implementing changes in late 2016, starting with the SIE exam and 3 specialized exams that make up the majority of all registrations: the Investment Company and Variable Contracts Products Representative (Series 6), the General Securities Representative (Series 7), and the Investment Banking Representative (Series 79) registration categories. FINRA says the remaining top-off exams will be implemented in the first half of 2017. Panelists at the FINRA meeting said that they are beginning to look at the principal-level qualification exam program to identify an opportunity for similar restructuring. Q. Will it be possible to take the essentials and top-off exams on the same day? Q. What about failing and retaking? A. If you fail the first time, FINRA says it will keep the same 30/30/180 day requirement. Q. Will the exam question style change? A. No, FINRA says the current question and answer style will remain the same: a multiple-choice question with four answer choices. Q. Will the essentials content be on the top-off exams? Q. Will there be a CE requirement for the essentials exam? Q. How will you keep the essentials exam questions secure? A. New security measures to prevent questions from being stolen are being developed. Also, FINRA says it has exam question pool rotation will be increased, meaning the exam questions will cycle faster than they have historically. Q. What about the FINRA exam waiver program, will it be affected? A. Yes, it will affect the program, but FINRA is not sure exactly how. Q. Will the restructure affect state registration? A. FINRA has been in touch with NASAA about the proposed exam changes and since FINRA, with the exception of retiring some registration categories, is not modifying registration rules, state registrations should not be affected much if at all. The FINRA Notice seeks comment on the proposal from the industry and other interested persons. You can email comments to pubcom@finra.org. The comment period ends July 27. Before becoming effective, the proposed rule change must be authorized for filing with the Securities and Exchange Commission (SEC) by the FINRA Board of Governors, and then must be filed with the SEC. Rationale: Arbitration of disputes involving customers is mandatory only if the customer consents to arbitration or if required by contract. Claims alleging discrimination or sexual harassment cannot be arbitrated, except by agreement of all disputing parties. 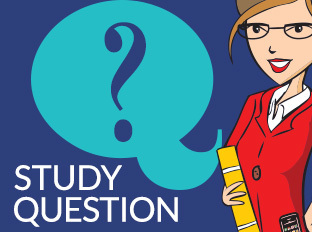 Weekly study questions are from Solomon’s industry-leading Online Exam Simulator.